During the previous article , we began to dive deeper into Red Giant Shooter Suite. If you missed that article you can catch up here. In this article I will continue to review the Red Giant Shooter Suite by taking a look at 2 more tools. These tools are known as Denoiser II and Instant 4K. Shooting on today’s cameras are just simply amazing. The low light capabilities are miles ahead of what they used to be only a short while ago. 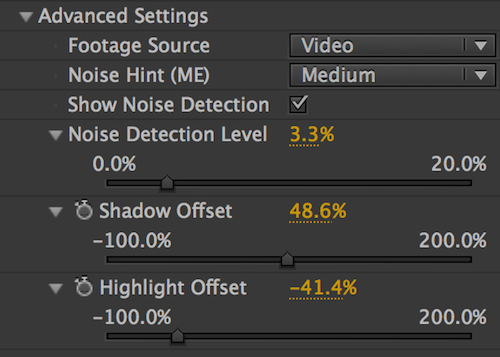 However, in many of these cases the higher the ISO we shoot the more unwanted noise is introduced into our footage. This is where Denoiser II steps in to help resolve the issue. 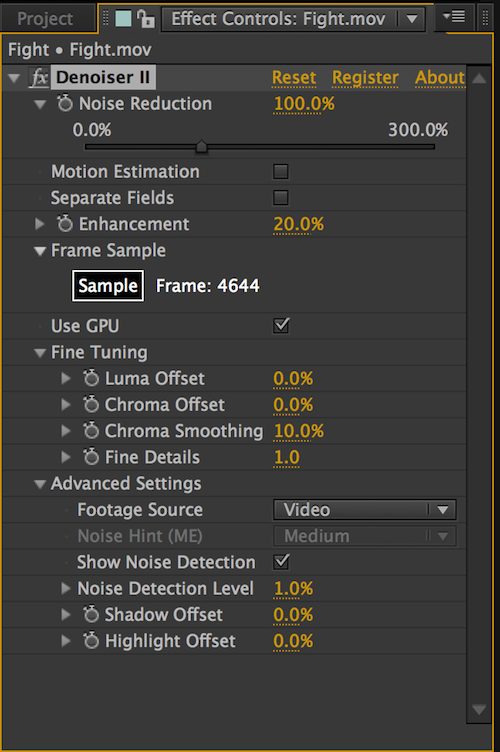 Denoiser II supports Adobe After Effects and Premier Pro CS5, CS6, and CC. It also supports Final Cut Pro 7. It features a new Use GPU checkbox makes Denoiser 1.4 run 3–4x faster than Denoiser 1.3. This is a great speed enhancement on systems and graphic cards that support OpenCL 1.1 (and higher). During my review, I chose to use After Effects as it really is one my favourite go to applications for visual effects of any kind. Once inside After Effects it really is easy as other filter to apply Denoiser II to your footage. Denoiser II provides you with a wide selection of adjustable variables from Fine Tuning the Luma and Chroma offsets, to more Advanced Settings such as Shadow Offset and Noise Detection. Noise Detection is actually one of may favourite features as Denoiser II will block out the areas with excessive noise with red patches. This makes it much easier to fine tune your image and remove noise without loosing sharpness or dulling the overall look. Denoiser II can in many cases will remove most of the noise in your shot at it’s default settings. However, for more fast pacing action sequences, I highly recommend using Denoiser II advanced setting to fine tune your look. Using options like Frame Sample, Motion Estimation, Noise Hint and Shadow Offset to create a new sample frame will help to preserve fast-moving action, and reduce chroma blotches. I found this works well to evenly remove excessive noise in the shadow areas. Denoiser II is an excellent application as part of Red Giant Shooter Suite. On it’s own it simply a must have piece of software as it can salvage shots that may have been deemed to badly damaged from noise and abbreviations. The next time you think a shot simply has too much noise to be used or must be re-shot. Try out Denoiser II , I’m sure you will see many benefits of adding this application to your edit suite. In a world where 4K is staring to become the norm, the question arises what to do with old stock footage shot in 1080p ? The cost to go back out and re-shoot everything again on 4k simply just does not make sense, and traditional upscaling within your NLE leaves your results much less desirable. Red Giant ’s Instant 4k provides a solution to your problem. 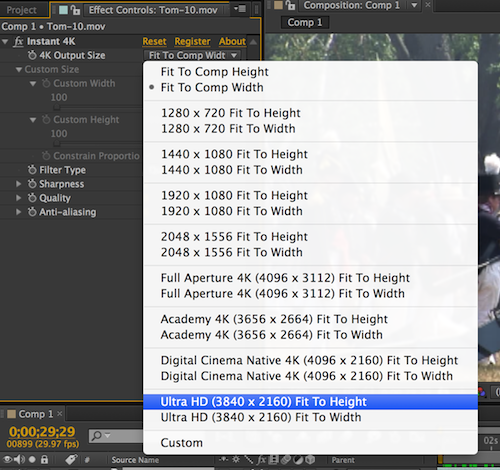 Instant 4k is compatible with Adobe Premier Pro and After Effects CS5 , CS6 , and CC on both Mac and PC. However there is no support for FCP7, and that’s perfectly reasonable as FCP7 is considered a legacy application. Instant 4k uses Red Giant’s unique algorithms to achieve much better result when upscaling your footage. Instant 4K is so simply to use and the UI for this plug in is made even easier with the ability to select from a wide election of presets. These include everything from 720p all the way up to Ultra HD. Each preset also has the ability to fit your image wither to the height or the width, giving you more control over the final product. However keep in mind to select shots that some shot will work better than others upscaled. Dimly lit shots will not work as well as outdoor shots. Instant 4k is the perfect plugin for anyone looking upscale their old stock footage. If you are looking for a more effective way to upscale from SD to HD or HD to 4K , then this plugin will provide you with excellent results. 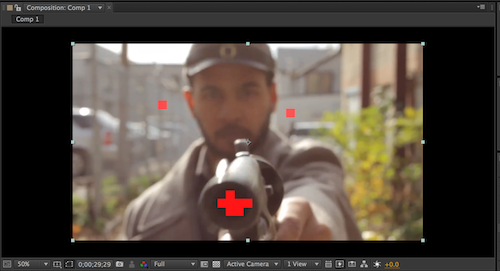 This is a much better way to upscale your shots rather than the standard NLE. Plus the cost of this plugin is really negligible to the gains you get out of it.